Today, over 23,000 children are impacted each year through micro lending at the VisionFund and World affiliated Ugandan microfinance institution (MFI), MED-NET. Through small loans, borrowers are able to send their children to school, provide access to healthcare, and ensure they are supported and cared for. Additionally, MED-NET provided nearly 14,000 loans totalling roughly $3,500,000 in 2009, and is currently experiencing over 26 per cent growth in portfolio. These recent social impact and financial successes at MED-NET come in response to a time when the MFI nearly collapsed and faced possible closure, just years prior. In 2006, an extensive audit of MED-NET found significant inconsistencies in reporting, delinquency levels, and liquidity. The audit discovered discrepancies between the actual and reported financial position of the MFI, showing unaccounted for losses and a lower overall financial portfolio. The faltering state of the MFI was attributed to a few key reasons. These included a combination of poor overall management and financial management, a lack of an effective management information system, a poor strategy of borrowing to pay for losses, poor delinquency management, and a lack of transparency and proper reporting at the management level of the MFI. VisionFund and World Vision leadership were faced with the decision to either close, sell, or rebuild the MFI. 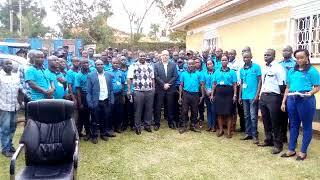 After careful consideration, and a thorough review of the current state of the MFI in relation to the mission of World Vision Uganda, the leadership decided to respond by addressing the faltering MFI and make an active effort to turn it around. Repairing and rebuilding an MFI from a fractured state is not a simple task. In fact, many leaders were involved in the process to identify key changes that needed to be made. Some change initiatives included replacing MFI leadership with professional and experienced staff, updating and communicating new policy, developing clear and consistent reporting mechanisms, instituting new key functions, providing a proper loan tracking system and finance solution, and addressing service concerns from micro borrowers while providing a better end-to-end experience.